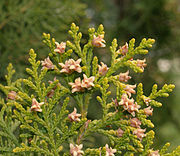 Platycladus is a distinct genus of evergreen coniferous tree in the cypress family Cupressaceae, containing only one species, Platycladus orientalis, also known as Chinese thuja, Oriental arborvitae, Chinese arborvitae, biota or oriental thuja. It is native to northeastern parts of eastern Asia and north Asia, but is also now naturalised as an introduced species elsewhere in Asia. Although generally accepted as the only member of its genus, it has been suggested that the closely related species Microbiota decussata could be included in Platycladus, but this is not widely followed. Other fairly close relatives are Juniperus and Cupressus, both of these genera being graft-compatible with Platycladus. 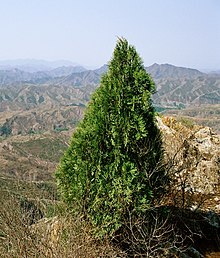 In older texts, Platycladus was often included in Thuja, which is reflected in one of its common names, "oriental thuja". 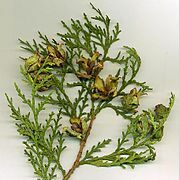 But it is only distantly related to the genus Thuja. 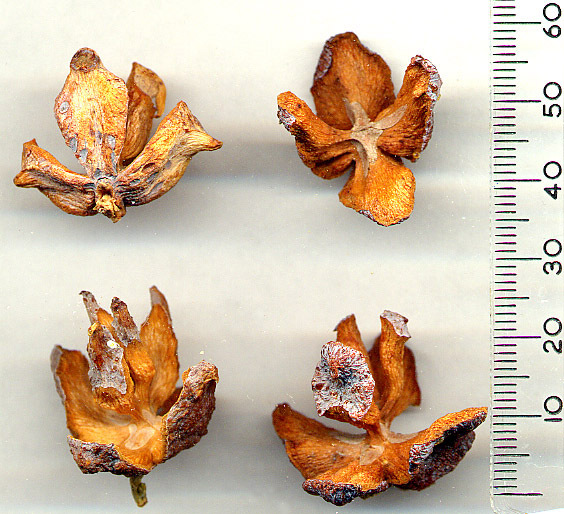 Differences include its distinct cones, wingless seeds, and its almost scentless foliage. The binomial Platycladus means "with broad or flattened shoots". The qualifier orientalis refers to its native habitat in China. The common name 'arborvitae' is from Latin, 'tree of life', and is based on its association with long life and vitality in Buddhist thought in China. This is probably based on the tree's unchanging evergreen nature in the cold dry climate of northwest China, and its longevity; some of the larger specimens planted around Buddhist temples in China are said to be in excess of 1,000 years old. It is called cèbǎi (側柏) in Chinese. A monoecious tree, it is small, slow-growing, reaching 15–20 m (49–66 ft) and 0.5 m (1 ft 8 in) trunk diameter (exceptionally to 30 m or 98 ft tall and 2 m or 6 ft 7 in diameter in very old trees). The foliage forms in flat sprays with scale-like leaves 2–4 mm (0.08–0.16 in) long, which are bright green in colour but may turn brownish or coppery orange in winter. The cones are 1.5–2.5 cm (5⁄8–1 in) long, green ripening brown in about eight months from pollination, and have 6–12 thick scales arranged in opposite pairs. The seeds are 4–6 mm (0.16–0.24 in) long, with no wing. The branches are relatively short, loosely arranged and, usually, sharply directed upwards, and the bark, brownish, is detached in narrow vertical strips. The twigs are compressed and are arranged in vertical planes. The leaves, arranged in four rows, fleshy, opposite, decussate, truncated, imbricated as adults, somewhat curved inwards, of uniform green color and with a resiniferous gland on the underside. The female cones, of pink-salmon color and later bluish-greenish when immature, centimetric and of annual maturation, are oval with 6-8 flattened, thick scales, coriaceous and provided with an apical hook. It is native to northwestern China, but it is delicate to distinguish the areas where they are native safely from those where they have been introduced. It is distributed in Manchuria, Russian Far East (Amur and Khabarovsk), and now it is naturalised in Korea, Japan, India and Iran as well. It is also cultivated in many parts of the world in parks, gardens, home yards, cemeteries and for hedges. Resistant to drought, it is very often used as an ornamental tree, both in its homeland, where it is associated with long life and vitality, and very widely elsewhere in temperate climates. It is suitable for form cuts and year-round opaque hedges, but also forms impressive slender solitary trees. Several cultivars have been selected, of which 'Aurea Nana' has gained the Royal Horticultural Society's Award of Garden Merit. The wood is used in Buddhist temples both for (lavairos) construction work, and chipped, for incense burning. Its twigs and leaves contain 0.12% essential oil containing pinene and probably caryophyllene. The roots contain up to 2.75% of gasoline. ^ Farjon, A. (2013). "Platycladus orientalis". The IUCN Red List of Threatened Species. IUCN. 2013: e.T31305A2803944. doi:10.2305/IUCN.UK.2013-1.RLTS.T31305A2803944.en. Retrieved 13 December 2017. ^ "Platycladus orientalis". Germplasm Resources Information Network (GRIN). Agricultural Research Service (ARS), United States Department of Agriculture (USDA). Retrieved 2008-02-19. ^ a b "Platycladus". World Checklist of Selected Plant Families (WCSP). Royal Botanic Gardens, Kew. ^ "Platycladus orientalis". Natural Resources Conservation Service PLANTS Database. USDA. Retrieved 7 October 2015. ^ "RHS Plant Selector - Platycladus orientalis 'Aurea Nana'". Retrieved 27 May 2013. ^ "AGM Plants - Ornamental" (PDF). Royal Horticultural Society. July 2017. p. 79. Retrieved 2 May 2018. ^ Armin Jagel, Thomas Stützel: Studies on the morphology and morphogenesis of the seed cones of Platycladus orientalis (L.) Franco (= Thuja orientalis L.) and Microbiota decussata Kom. (Cupressaceae) . Bot. Year syst. Bd. 123, 2001, pp. 337-404. Conifers Around the World: Platycladus orientalis - Oriental Arborvitae. Wikimedia Commons has media related to Platycladus orientalis. This page was last edited on 23 October 2018, at 03:33 (UTC).